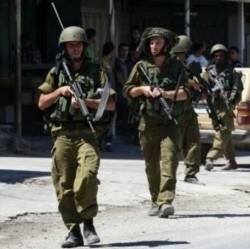 Israeli soldiers invaded, earlier on Thursday morning, Abu Dis and the al-‘Ezariyya towns, in occupied Jerusalem, kidnapped one Palestinian, and injured at least twelve others during ensuing clashes. The Israeli police said it uncovered two workshops, allegedly used for manufacturing weapons and explosives, in Abu Dis town east of occupied East Jerusalem. It added that the workshops were uncovered in a joint operation with the army and security services, and that the search uncovered two caches of weapons and mentions. The Police also hinted that it intends to demolish the two facilities at a later time. In addition, the Palestinian Red Crescent Society (RCS) said its medics provided the needed treatment to twelve, who were injured by army fire, during clashes in Abu Dis and al-‘Ezariyya. It said four Palestinians were shot with rubber-coated steel bullets, and eight others suffered severe effects of tear has inhalation. On Wednesday evening, Israeli soldiers invaded Shu’fat neighborhood in occupied Jerusalem, and kidnapped a child, and also kidnapped a teenager near Tulkarem, in the northern part of the West Bank.